In 2004 several writers and proofreaders were brought together by a new mobile phone publishing business. Sadly the business (Kwickee) came unstuck, but some of the writers who met during its brief existence decided that their skills were worth combining into a new business venture. 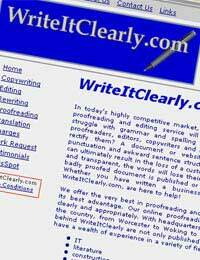 In January 2006 Garry Pierrepont, Romany Howes and Marilyn Owen became partners at WriteItClearly.com. With Garry based in Surrey, Romany based in Worcester and Marilyn based in Hertfordshire, these three created a true virtual business for the twenty-first century. The three were already working from home on individual projects, so it was easy to merge the activities of the new venture with their own. The set up costs were negligible and over the first few months they each put in £300. There were no loans from anyone else; thus, the business was set up for less than a thousand pounds. Armed with a website and business cards, they quickly went … nowhere. In January 2007 the AGM of WriteItClearly.com was held virtually, using MSN (now Live Messenger) as the medium. Despite the lack of work in the first year, they decided to carry on – but this time with a bit of marketing. They enhanced the website, joined several provider websites, joined online networking sites such as Ecademy, LinkedIn and Network 2Connect and began to get their name better known in the industry. Communication between the three was, and is, carried out mainly by email, with some contact by Live Messenger. They rarely use the phone (though Garry says his BlackBerry is invaluable! ), and only meet once a year for the AGM in January. The efforts to make the business more established paid off in the second year. Turnover increased to £6,500 with no loans. Boosted by this, the target for turnover in 2008 was set at £21,000, and exceeded that, reaching nearly £22,000. The three partners carry out much of the work themselves – and get paid for it – but realise that the path to a really successful business is to outsource work to contractors. However, they’re not naïve enough to believe that success last month means success the next. They already have some prestigious clients: National Housing Federation, University of Hertfordshire, Addison, Headlines and Direct Traffic Media are among them. “They keep coming back, so we must be doing something right,” says Garry.